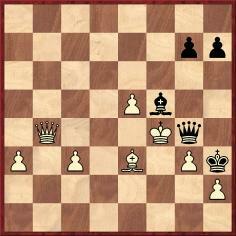 A number of chess literature’s most famous games feature a king which wanders into the open, in most cases reluctantly. That fine writer W.H. 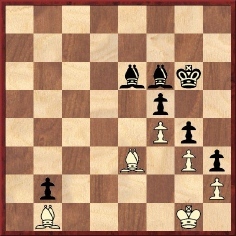 Cozens (1911-84) published a book entitled The King-Hunt, and T. Krabbé’s Chess Curiosities had a lengthy chapter on what he termed ‘Steel kings’. Here we examine some other, neglected examples from yesteryear, beginning with the most frequent type: enforced peregrinations. 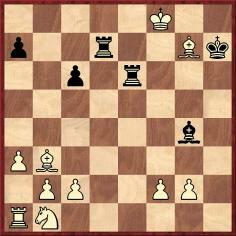 In the position below, the black king is smoked out by a violent combination prepared by an innocent-looking pawn move. 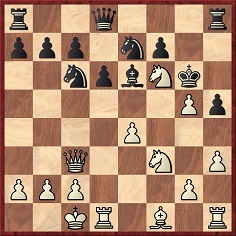 White to move (William Cook and William Henry Krause Pollock – Francis Joseph Lee and Oscar Conrad Müller, London, January 1888). 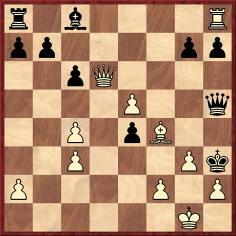 White played 1 a3 and, after the routine reply 1...a5, unleashed 2 Nxe6 Kxe6 3 Qxd5+ Kxd5 4 Ba2 mate. 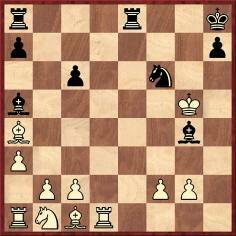 20...Nd5 21 exd5 Qxf4+ 22 Kxf4 Bd6+ 23 Kg5 f6+ 24 Kh4 Bf4 25 Ne4 Rxe4 26 dxe4 g5+ 27 Nxg5 fxg5 mate. 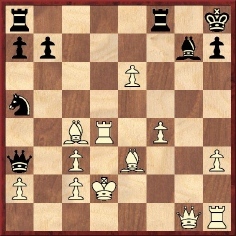 Source: Brooklyn Chess Chronicle, 15 June 1884, pages 137-138. 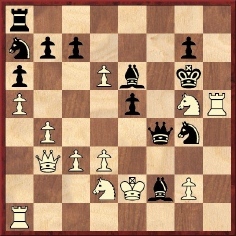 White played 1 Qe2, and Black announced an elegant mate in four: 1…Ne5+ 2 fxe5 Qxe4+ 3 Kxe4 Bb7+ 4 Kf4 g5 mate. 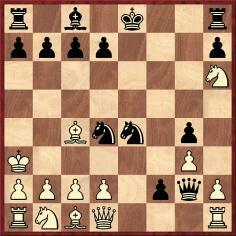 18 Qh3+ gxh3 19 g3 mate. Source: Deutsche Schachzeitung, August 1857, pages 267-268. 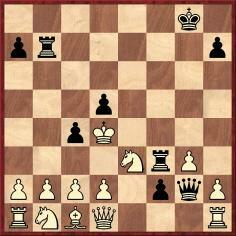 Next, two specimens in which the dragnet is set up by the move Qxg7+, followed by a powerful double check. 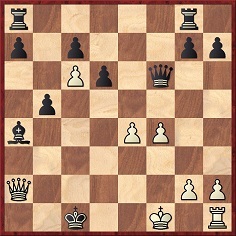 White to move (Vane – Miles, Sydney, 1897). 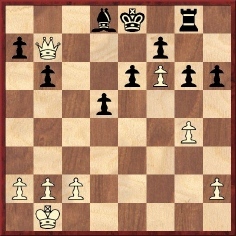 1 d5 Nxd5 2 Qxg7+ Kxg7 3 Be5+ Kh6 4 Bg7+ Kh5 5 Rxd5+ f5 6 Nf4+ Kh4 7 Rg4+ fxg4 8 Rh5 mate. Source: Deutsches Wochenschach, 19 December 1897, page 467. 18 Qxg7+ Kxg7 19 Nf5+ Kg6 20 Nxh4+ Qxh4 21 f5+ Bxf5 22 exf5+ Kh5 23 g4+ Qxg4+ 24 hxg4+ Kxg4 25 Rf4+ Kg3 26 Raf1 Ng5 27 Bd4 Nh3+ 28 Kh1 Nxf4 29 Rxf4 Resigns. 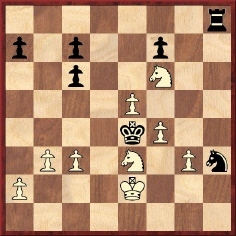 Source: American Chess Bulletin, September 1908, page 191. 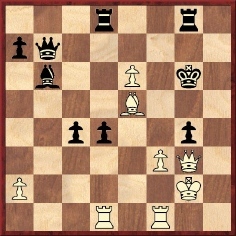 22 Qxe6+ Kxh5 23 Rh1+ Bh4 24 Ngf3 Qe3+ (Here Mason recommends 24...g5.) 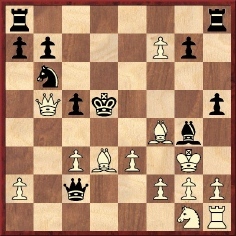 25 Kd1 Nf2+ 26 Kc2 Qxd3+ 27 Kb3 g5 28 Nxe5 Qxd6 29 g4+ Resigns. Source: BCM, February 1900, pages 72-73. 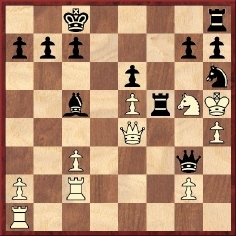 22…g6+ 23 Kxh6 Bf8 mate. Source: BCM, February 1919, page 56. 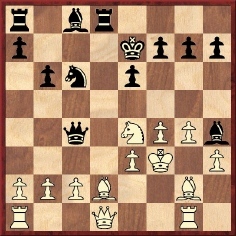 Source: tournament book, pages 168-169. 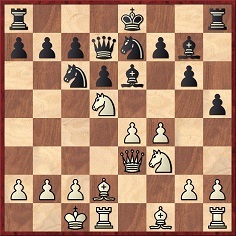 24 Bb2 Nb3 25 Bxh8 Nxa1 26 Nd2 mate. Source: BCM, January 1884, page 20. 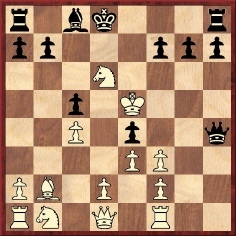 1 e4 e5 2 Nf3 Nc6 3 Bb5 Nf6 4 O-O Nxe4 5 d4 Be7 6 Qe2 Nd6 7 Bxc6 bxc6 8 dxe5 Nb7 9 Nc3 Nc5 10 Nd4 Ba6 11 Qg4 Bxf1 12 Qxg7 Rf8 13 Kxf1 Ne6 14 Nf5 Bg5 15 Qxh7 Bxc1 16 Rxc1 Qg5 17 Re1 Qg6 18 Ne4 Qxh7 19 Nf6+ Kd8 20 Nxh7 Rh8 21 Nf6 Rxh2 22 Kg1 Rh8 23 Rd1 Nf8 24 Nd4 Kc8 25 Nf5 (‘Trying it on. 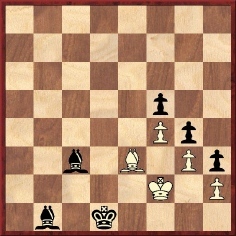 Black’s king might have come back again. It is not clear what he hoped or expected by going to b7.’ – E. Freeborough.) 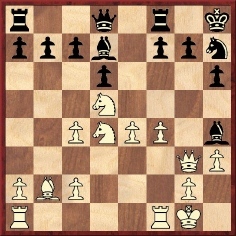 25...Kb7 26 Nxd7 Ne6 27 Nf6 Rad8 28 Rxd8 Rxd8 29 Ne3 Kb6 30 Kf1 Kc5 31 g3 Kd4 (‘The king is a strong piece and he plays boldly. The ending shows, in amusing fashion, how he may easily be too bold.’ – E. Freeborough.) 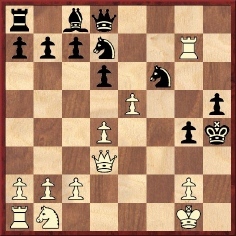 32 Nfg4 Ke4 33 Ke1 Ng5 34 Ke2 Rh8 35 c3 Rb8 36 b3 Rh8 37 f4 Nh3 38 Nf6 mate. Source: BCM, November 1890, pages 456-457. 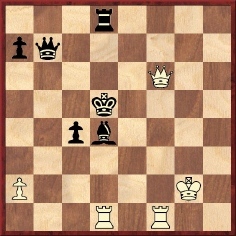 21 Kc4 Bb4 22 Nxb4 a6 23 Ned5 c5 24 Qd2 Resigns. Source: BCM, May 1893, page 239. 36 Qh1!! Bb6 37 Qd1!! Ka5 38 a3! b3 39 Bxb3! Qb5 40 Bd2+!! c3+ 41 Ke1! Bxd4 42 bxc3 Resigns. Source: Československý Šach, April 1928, pages 54-55. 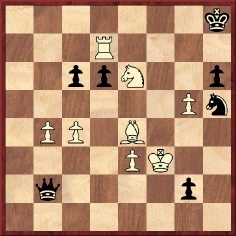 Although Treybal lost, the game was also published on page 115 of the monograph Dr Karel Treybal by L. Prokeš (Prague, 1946). 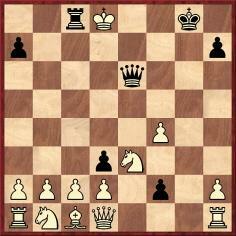 38...Kc5+ 39 Qf3 Rg8+ 40 Kh2 Qh7+ ‘and Black wins’. 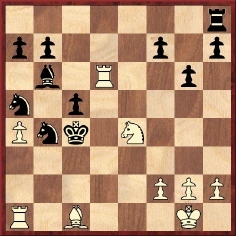 Source: Chess Player’s Chronicle, October 1875, pages 337-338. 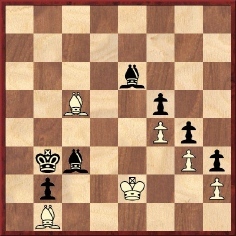 White to move (Edersheim and Rudolf Johannes Loman – Censer and van’t Veer, The Hague, 14 May 1915). 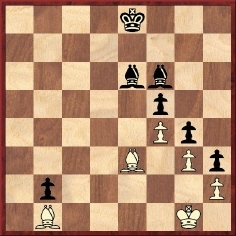 White played 25 Qxa7 and the game was eventually drawn. 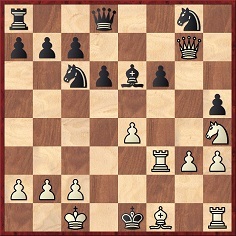 In the Amsterdam publication Weekblad A. Speyer pointed out that White could win easily and prettily by 25 Qc6+ Kf8 26 Qc8 Ke8 27 h4 (Preventing 27…g5, followed by 28…Rg6. If 27…g5 then 28 h5.) 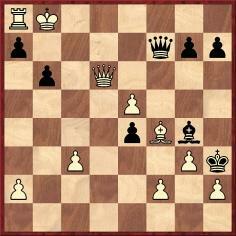 and the white king is free to infiltrate. Source: Deutsche Schachzeitung, September 1915, page 269. 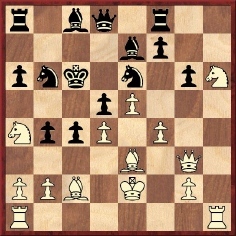 22…Qxc3 23 Nf3 Bd7 24 Qb1 Qf6 25 Ng5 h4+ 26 Kf3 c4 27 Be4+ Kc5 28 a3 a5 29 Rd1 Rh5 30 Rd6 Bg4+ 31 Kxg4 Rxg5+ 32 Kf3 Nd5 33 Bxd5 and wins. Source: BCM, September 1918, page 278. It was stated that ‘Master Croy’ was aged 15. 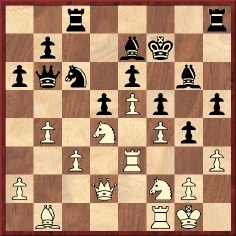 41…g1(N)+ 42 Kg4 Qe2+ 43 Kf5 Ng3+ 44 Kf6 Nxe4+ 45 Kg6 Nf6 46 gxf6 Qg4+ 47 Kf7 h5 48 Nf8 Nf3 49 Ke8 Ne5 50 Rh7+ Kg8 51 Rg7+ Qxg7 52 fxg7 h4 53 Nh7 h3 54 Nf6+ Kxg7 55 Nh5+ Kh6 56 Ng3 Drawn (although the endgame is a win for Black). Source: Deutsche Schachblätter, 15 November 1937, pages 346-348. 92 Kg1 Ke2 93 Bb6 Be1 94 Bc5 Kf3 95 Bb6 Bxg3 96 hxg3 Kxg3 97 Bf2+ Kxf4 98 Kh2 Kf3 99 Bc5 f4 100 Bb6 Bf5 101 Bg1 g3+ 102 Kh1 Be4 103 Bb6 and Black mates in two. 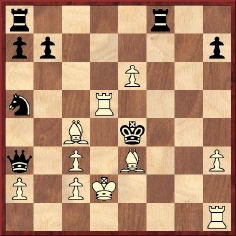 Source: Brooklyn Chess Chronicle, 15 August 1884, page 168. 18…c5 (Soultanbéieff gives this two exclamation marks.) 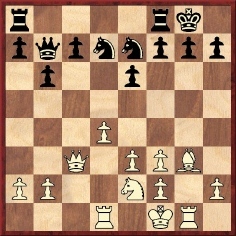 19 Nd6+ Ke7 20 Nxc8+ Raxc8 21 f4 Rhd8 22 Kxe4 f5+ 23 Kxf5 Rf8+ 24 Ke4 g5 25 Be5 gxf4 26 Rh1 Qg5 27 Rxh7+ Ke6 28 Qh5 Qg2+ 29 f3 Resigns. 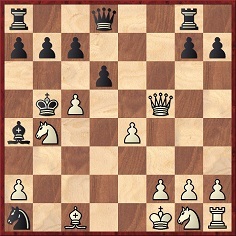 Soultanbéieff now analysed eight White moves as leading to a win for Black, one example being 20 Nxf7+ Kc7 21 Nxh8 Qg5+ 22 Kxe4 Qf5 mate. A possibility not mentioned is 20 Kd5, and C.N. 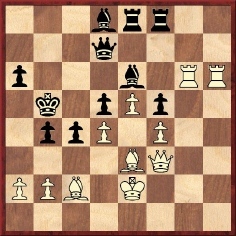 2977 asked if Black also won after that move. In C.N. 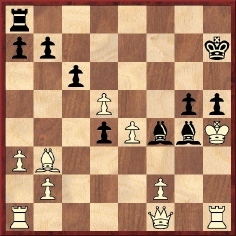 2981 Karsten Müller (Hamburg) responded that after 20 Kd5 b6 Black does indeed win, as follows: 21 Nxc8 (Or 21 d3 Qe7, and if 21 Be5 Be6+ 22 Kc6 Qe7.) 21...Kxc8 22 f4 f5 23 Be5 Qe7. Source: Šachs Latvijā by K. Bētiņš, A. Kalniņš and V. Petrovs (Riga, 1940), pages 265-266. 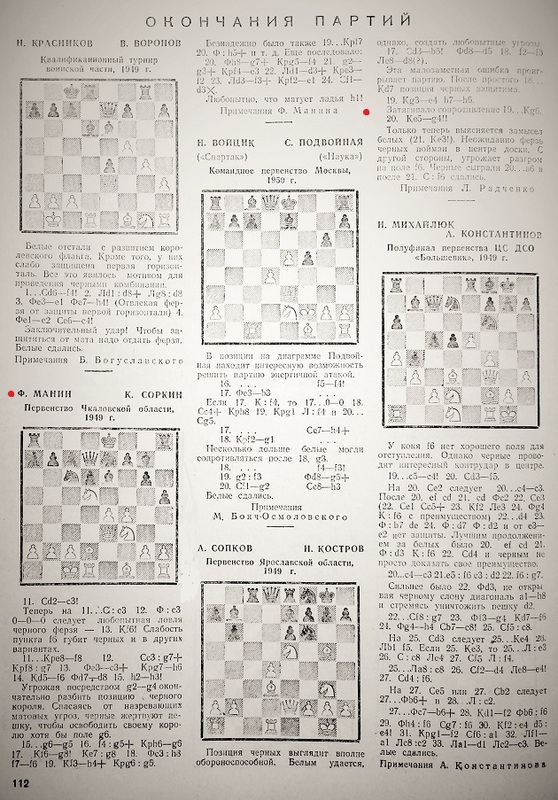 The game also appeared, with detailed (languageless) notes on pages 229-230 of Bogoljubow – The Fate of a Chess Player by S. Soloviov (Sofia, 2004). 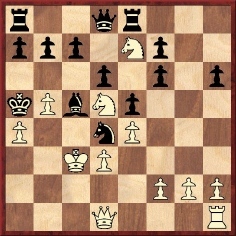 29...Re2 30 f4 Rxg7 31 Nc3 Rd2 32 Rh1+ Kg6 33 f5+ Bxf5 34 Rd1 Rf2 35 Ke8 Rb7 36 White resigns. 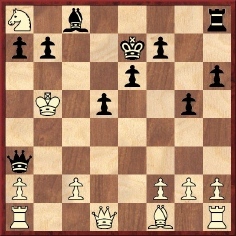 Sources: BCM, May 1915, page 173; Chess Amateur, August 1915, page 327; The “British Chess Magazine” Chess Annual 1915 by I.M. Brown (Leeds, 1916), page 171. For a note on Arthur A. Murray, see C.N. 8190. 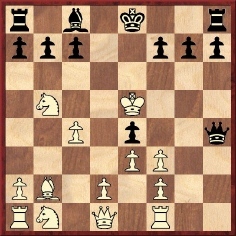 25...Rf4+ 26 gxf4 Qe4+ 27 Kc3 d4+ 28 Kxc4 d3+ 29 Kc5 Rc7+ 30 Kd6 Rc6+ 31 Kd7 Qe6+ 32 Kd8 Rc8 mate. 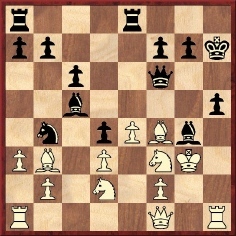 As regards the missing opening moves, our correspondent points out that the position after Black’s tenth move occurred in Chigorin v Mackenzie, Vienna, 1882 with one exception: Mackenzie played 10...O-O-O and did not move his h-pawn. Source: pages 152-154 of Das II. Internationale Schachmeisterturnier Wien 1882 by C.M. Bijl (Zurich, 1984). Source: Philadelphia Inquirer, 26 February 1950, page 22. Isaac Ash’s column stated that the game was ‘played in a recent mail contest’. Latest update: 1 January 2017.